Speaking of that thread, for Star Ocean 2 it would be neat to make voices occur less often in battle. Everyone has something to say with everything every time and it all happens at once, from the very beginning of a skirmish on. It can get grating at times, especially with the english VAs. In Dragon's introduction, while the Evirs are flying around before Draygon himself appears. During the Golden Torizo's initial appearance, ala the first Torizo. I like this idea better, if there was a way to make the game use battle shouts less often rather than removing them entirely would be ideal. Several JRPG games like this require it. this is cool, thanx for the information. So, there's this PS1 gem called Zanac X Zanac that has never been translated except for maybe the PSN release. but that ain't the only idea I had (More really because only the retro Zanac in Zanac X Zanac is what needs to be translated), because part of the idea I had is of making it so weapons in Zanac do not have an ammo restriction and some sort of difficulty selection for MSX and NES releases. How would one start going about hacking a game like Gauntlet/Gauntlet 2? I would like a Werewolf: The Last Warrior for NES hack which adds many improvements to Gameplay and Level Design, making the game less unfair and broken. You'll see what I mean when you play it. Has anyone seen a hack where the secret characters and modes are available instantly? I know you are supposed to leave the game running... but honestly who has time for that? There are also operator codes in the service menu. BUT ... I was looking for a hack that has hard coded these options into the rom. Anyone seen one? Anyone think they could code this ? we need a patch that sticks the GBC game Wendy Every Witch Way into "Forced GBA mode"
it plays a lot like VVVVV that indie gravity reversal game. anything WayForward touches is golden! As some of you may know, the Wii version of Okami was released in Japan a few months after it came out in the West, which gave the team some extra time to make a lot of improvements to it (specifically the controls and restoring the original credits sequence from the PS2 original). Now as far as I'm aware the Japanese version doesn't have English text - if it did though, it would probably be my preferred version of the game. Is anyone else interested in the idea of either a) adding English text to the Japanese Wii version of Okami or b) finding some way to fold all the improvements from the Japanese version back into the Western releases? I have next to no programming knowledge, but if anyone were interested in pursuing this idea, I'd be glad to help any way I can. So...this one idea, how about making all of the sonic bosses from 1,2,3, and Knuckles much more harder? Changing the way each boss battles you, etc. Anyone noticed how unbalanced the bonus dungeons are in FF1 for PSP? I think the normal enemies need a re-balance because when you do the first bonus dungeon at a later date you'll end up being too powerful..but if you do it as soon as you see it..you'll get wiped to the floor by the bosses, but the enemies give you a false sense of security thinking this dungeon is easy. The enemies and bosses are way too unbalanced as I believe the enemies should be just as much of a threat as the bonus bosses. FF2 bonus dungeons have the same issue. I remember trying to tackle this in the past, but looking in my files there are no notes, so I didn't get far. The level design is ultimately bad, so that would have to be changed too if this was to be made into a good game. I guess that's when I realized it wasn't a simple task and lost interest. It's sad, the game has lots of good and bad stuff. Oh wait you mean the original maps from Zelda 1 in BS Zelda? That would be hard to do, the map grid in BS Zeld is smaller than that of the original, so not all rooms/screens can fit. Think that's what was meant. And love to see that too! More a question than an idea, but... Is it possible to add Black's Palace in Gunstar Heroes for Game Gear? At least a redux version, where you just play the board game part. 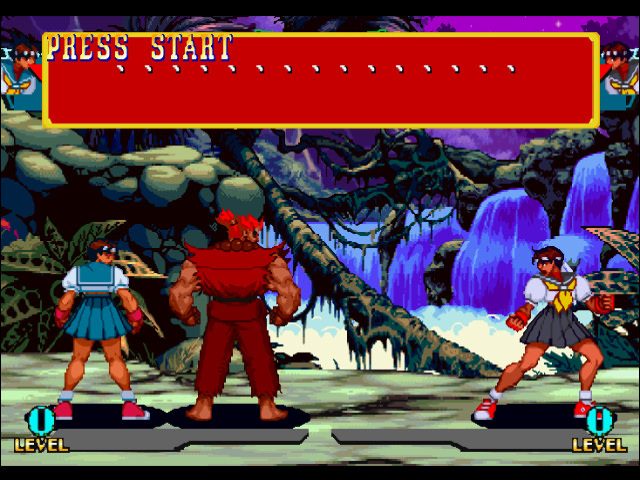 A minor color fix for all console versions of Marvel Super Heroes vs. Street Fighter. 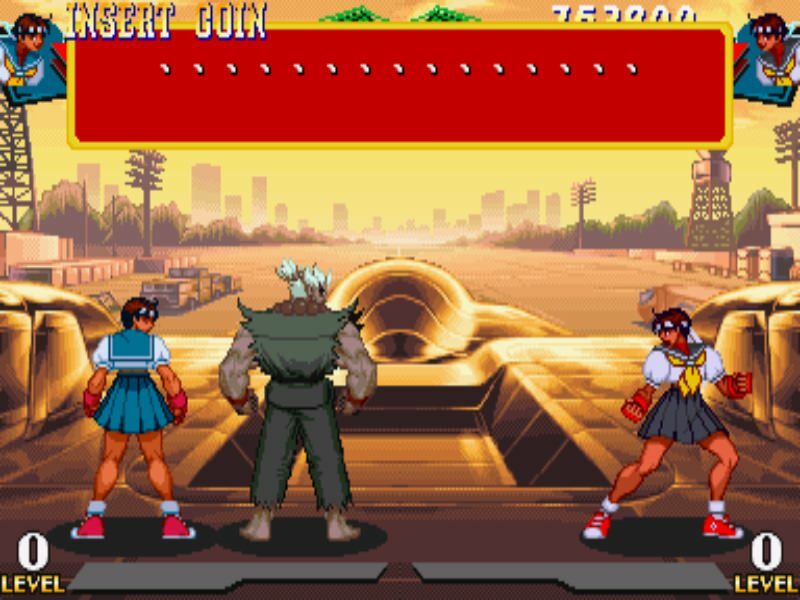 Swap the colors 2 and 4 of Akuma to match his arcade Kick color. I pick Akuma and Dark Sakura to make this example understandable using the japanese versions. Another idea: enable the conditions for the hidden battles in overseas versions. Remove a bunch of stuff from Millipede for NES to create Centipede for NES because why not? US version of Castlevania Dawn of Sorrow (for Nintendo DS) with ALL the Japanese voices intact.